Cebu Pacific Promo Fares 2019 to 2020: Low Fares For May to August 2012 Travel! 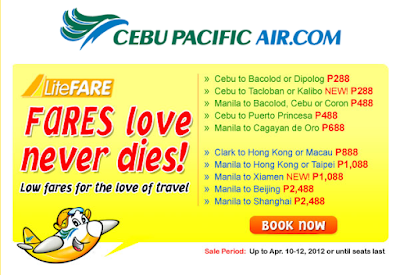 Cebu Pacific is now offering some low fares on Domestic Destination!!! Cebu to Bacolod, Butuan, Dipolog, Dumaguete, Iloilo, Ozamiz, Pagadian, Tacloban or Kalibo NEW! Manila to Guangzhou, Hong Kong, Macau, Taipei or Xiamen NEW! how about dumagute to manila?